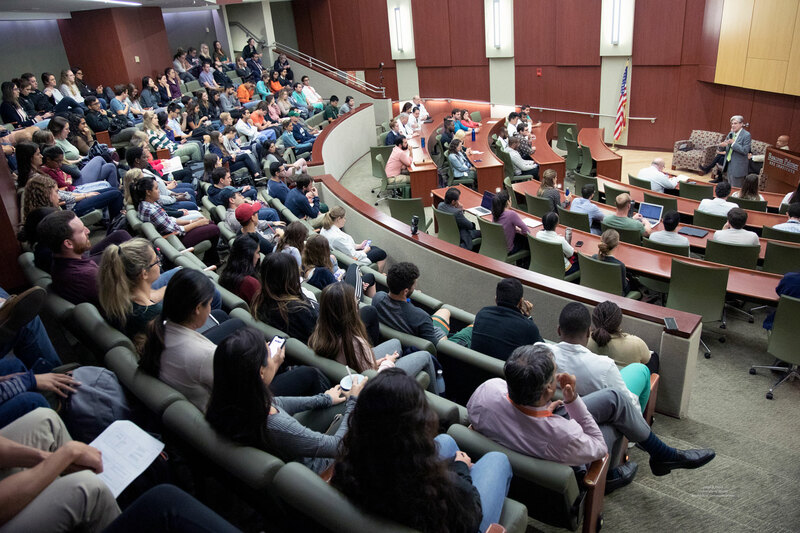 In a wide-ranging interactive discussion organized by the University of Miami Miller School of Medicine Student Government, the leaders of UM, the Miller School and UHealth – the University of Miami Health System shared their strategic visions with medical students. 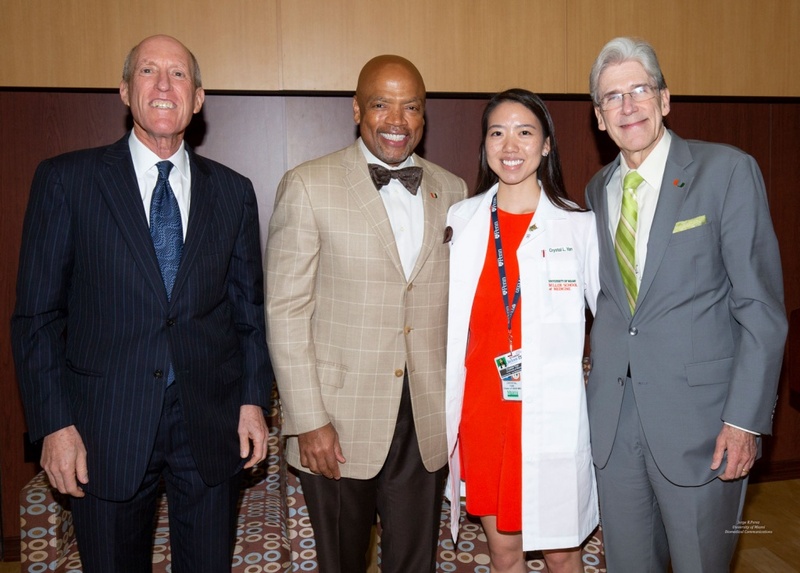 From left, Edward Abraham, M.D., Henri R. Ford, M.D., MHA, Crystal L. Yan and President Julio Frenk. UM President Julio Frenk joined Executive Vice President for Health Affairs and UHealth CEO Edward Abraham, M.D., and Miller School Dean and Chief Academic Officer Henri R. Ford, M.D., MHA, who described their common vision of making the Miller School and UHealth the preferred destination for anyone seeking the latest advances in biomedical research, innovative medical care and outstanding medical education. Dean Ford also talked about President Frenk’s lofty goals for the university as a whole — to make UM known as a hemispheric, excellent, relevant and exemplary institution — and how the medical system has the opportunity to leverage its strengths, centers of excellence and interrelationships with other UM schools and colleges to help achieve those goals. Noting that research and education make UHealth the only academic medical center in South Florida, with the largest faculty practice plan in the state, Dr. Abraham said UHealth’s challenge is differentiating itself from non-academic medical centers — especially when patients tend to come to UHealth and its competitors with the same problems and conditions. Some of that challenge is being met by 5 to Thrive, UHealth’s five-part strategy for becoming a preeminent medical institution with an unparalleled patient experience. A spectrum of destination programs is being developed to offer patients — both local and from around the world — the opportunity to experience the UHealth difference. A new research strategic plan was developed that focuses on areas in which UHealth and the Miller School are preeminent and which can be linked to clinical programs. Medical students, who filled the auditorium, asked a wide range of follow-up questions. When it was his turn to speak, President Frenk noted that all three of the leaders held M.D. degrees — something he described as a “visual expression of why medicine is so important to this university.” He said that expression should be seen in the context of the “Roadmap to Our New Century,” UM’s five-part strategic plan that will guide the institution as it approaches its centennial in 2025. “Preeminent Academic System” is one of those aspirational pillars, along with “Administrative Excellence,” “Mission-Driven Research,” “Education for Life” and “Hemispheric Leadership.” He described the plan as having specific initiatives designed to help UM achieve quantitative targets. President Frenk noted that the “Roadmap” and its strategic pillars also play a crucial role at this time, when the basic idea of universities is being challenged. The students responded enthusiastically, with follow-up questions that generated discussions on topics ranging from the evolution — and the cost — of medical education to the impact of climate change to the relationship with Jackson Memorial Hospital.